Okay, so I know that Copacabana is the beach most people associate with Rio de Janeiro; however, if I only had one day to spend at a beach in Rio, I would choose to go to Ipanema beach over Copacabana for the day – and I would recommend that you do the same. Don’t get me wrong, Copacabana is amazing. To read all my thoughts on this beautiful part of Rio, check out my guide here. But Ipanema is my favourite out of the two. There are two main reasons I love Ipanema so much. The first, is the geography and the setting of the beach. The geography of Rio de Janeiro is, I think one of the citys greatest marvels. It is truly stunning and for me, Ipanema beach epitomizes this uniqueness. You have the gorgeous deep green of the mountain towering over one end of the beach. As you walk closer you can see specks of colour begin to pop up and stand out against the dense green, as the favela which climbs up the mountainside begins to come into view. On a slightly overcast day, the peak of the mountain and the range of mountains behind it fade into clouds above. A second mountain range defines the rest of the beach, as concrete towers of hotels and apartments line the beachfront all the way down to Copacabana Fort in the distance. 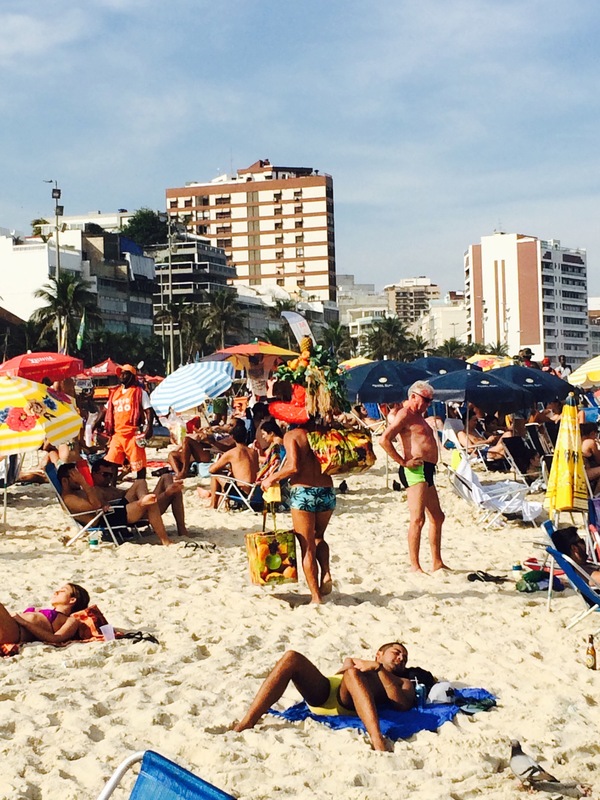 These two contrasting backdrops create the unique context in which Ipanema beach sits. 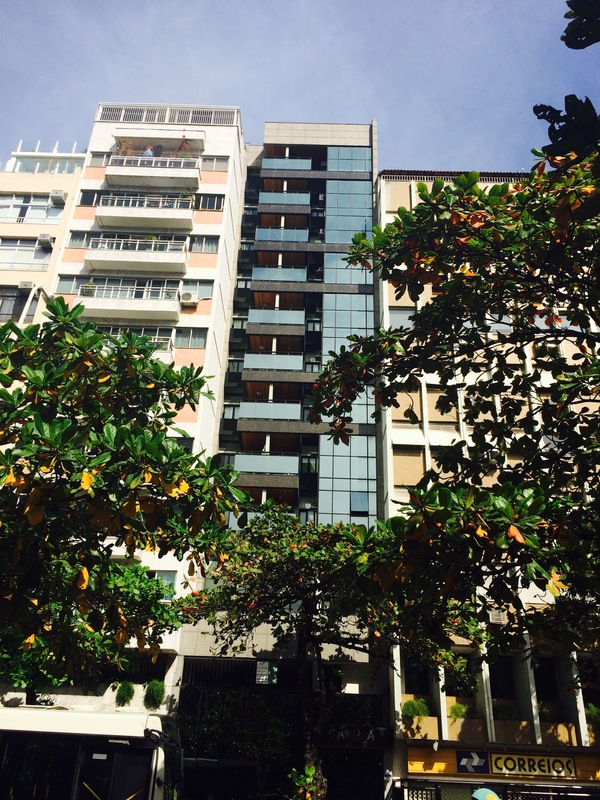 It’s the juxtaposition of wild nature and concrete city life, of rich and poor that defines Ipanema; and epitomizes the city of Rio de Janeiro itself. 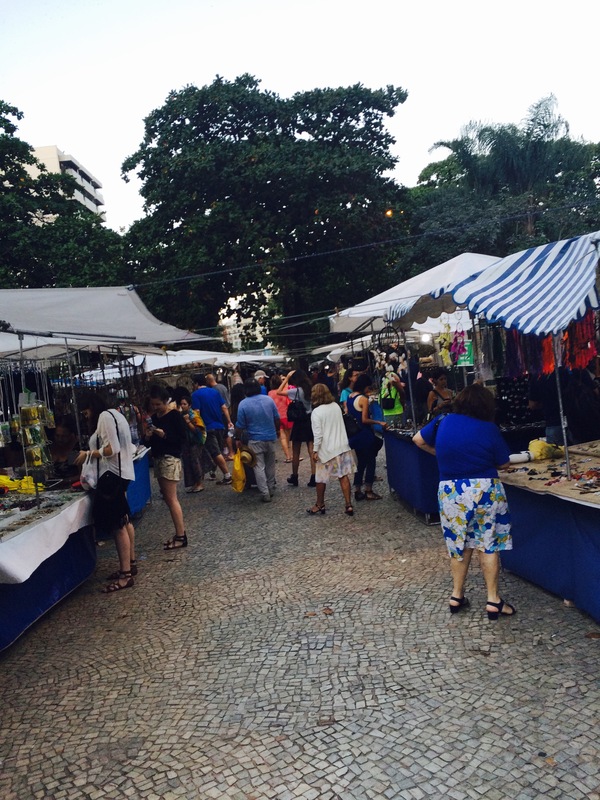 The second reason I love Ipanema is the general vibe that both the beach and the neighborhood have. The beach is colourful, vibrant and filled with people from all walks of life. Now, I will say that my viewpoint may be slightly skewed, as unbeknown to us we accidentally set up camp for the day in between the two rainbow flags which define a particularly colourful area of the beach. Having said this, when we returned and spent a second day in a different area of the beach, I can confidently say that it was just as colourful, interesting and filled with the same great vibe as the first day. 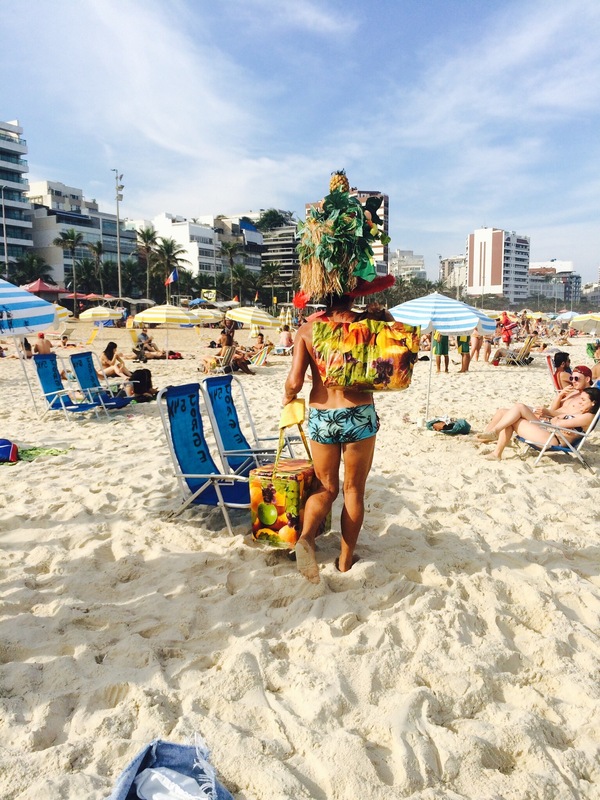 Just like Copacabana, there are people walking up and down the beach trying to sell you everything from food and drink to bikinis and jewelry. You can also chose to pay to rent a couple beach chairs and an umbrella for the day if you like. When we were there during the off-season we paid around 15reis for two chairs and an umbrella for the day. My one caution would be if you are a traveling family, that the beach is quite steep and is known to have quite a strong current at times. If you get the right tide then the slope of the beach flattens out in places and there can be some kid friendly areas for little ones to still play and have fun in the water. The vibe that I love so much about the beach also transfers into the neighborhood of Ipanema itself. Ipanema takes the slightly slower pace of Copacabana to the next level and the whole neighborhood has a relaxing, holiday beach vibe to it. The streets leading away from the beach are lined with trees and nicer apartment buildings and once you get a few blocks back you will find a wide variety of restaraunts, cafe’s, bars and shops. The metro station is a 10 minute walk from the beach max. and there is a street market in the square outside. You want to get off at General Osorio station and make your way to the beach from there. The market is on the expensive side of things, however it’s a great place to spend a bit of time walking through and looking at all the artwork and many hand crafted items. Ipanema and Copacabana are both great parts of Rio. If you can visit both, I highly recommend you do. Although they are located right next to each other, both neighborhoods and beaches have something different to offer. Copacabana is famous for a reason; but in my opinion, if you want the best “beach day” in Rio, then Ipanema is the way to go.